I couldn't resist the thought of being able to make a bunch of quickie buildings to help fill out a small town. I haven't stopped thinking about kitbashing the Tumbleweed set with Thoumont's textures since I heard it was released! I can't wait to have a bunch of pieces done up and folded nicely on the shelf! It's fast enough that I could cut this little fella out by hand, edge and glue it together all while the presidential debate is still droning on with their first question! I'll start putting together some of the basics - there are few enough pieces in the "Tumbleweed Pass" set that would apply to Thoumont's that I think I can make a compelling set of pieces quickly. With no interiors... It's super fast! Assuming this goes well, I won't hesitate to pick up the Feisty Friar set, and START by making SwiftScenics pieces! Yes. This is precisely what I need to pad out my cities. I also find that tiny brads can by just the ticket to fasten the roof tight, if needed. SwiftScenics, I think, has solutions built-in for these problems. They have a cross-support mechanism, though I haven't tried it out yet. The roof pieces actually slot into place quite nicely, so there's no need for additional fasteners. This I did try out and it worked better than I expected. The only thing I might do differently is to double the thickness of the walls and roof to really make them heavy and rigid. I've done this with other models, and it feels so much more substantial. Once I get a more complete set of 3" and 6" walls done, I'll make some pages for these extra bits (and cutfiles). I spray-glue them in place, which seems to avoid any warping issues. SwiftScenics, I think, has solutions built-in for these problems. They have a cross-support mechanism, though I haven't tried it out yet. You're welcome for the cutfiles! I haven't built any SwiftScenics (not my genre(s)) other than the Deadlands:Deadman's Canyon and that definitely got me playing with cross-supports. It's a pretty simple idea that I don't claim any original credit for. I finished off *all* the pieces from the "3 Inch Roofs" pdf using Thoumont's textures. I started making the "6 Inch Walls" pdf pieces, and I'm about half-way done with sliding around the "stone" type Thoumont's walls there. I'm looking forward to posting some pics involving 6" walls. I continue to inch forward making progress with a SwiftScenics version of the Thoumont's set. Today, I tore through finishing all of the 3" roof pages, all of the 6" wall pages (using the stone wall and wood wall textures from Thoumont's) and some 6" roof textures. I took my time getting some details right. There's a top edge to the roof pieces, and the peaks on the walls came out nice using the wood texture. I followed the DeadFall - Tumbleweed Pass set's wall layouts (window/door placements) so I ended up with 13 pages of walls using the wood/stone combination. Of course, Thoumont's comes with plaster walls and plaster-and-beam walls too, so I will make variants for those as well. Thankfully, the plaster and the stone walls only really work on the 1st floor, so that minimizes some of the combinations. I think I will complete the 6" roof pieces and then try some other pieces, like the awnings and balconies. This sure is shaping up to be the much needed replacement for VillageWorks. I'm working exclusively with the great textures from the Thoumont's set. I'm trying not to go overboard, so I've settled on two themes for walls. The first will be the stone/plaster walls on the first floor, and the wood walls on the second/third floors. The second theme will have the full plaster walls on the first floor, and the plaster-and-beams on the second/third floors. I could go crazy mixing more wall types, but I want to move onto other parts of the set! So, I'm just about done with all the 6" walls for those two themes (that's 26 pages of kitbashing goodness), and I have all of the roof pieces for 3" and 6" sizes done (that's another 12 pages). I can see as a later addition, using textures from the CWU set or the Harbormaster set to come up with some more buildings. I was looking at the promo pics of VillageWorks, and I could easily see turning everything in there into a fold-flat, SwiftScenics building. I just don't see myself dropping $17.00 on VillageWorks just for the thrill of kitbashing... Too many other things to work on right now! LOL. You mean, all the stuff that was in VillageWorks? If the textures on those props are still up to snuff, it'd be cool to see them released as a stand-alone props pack. Finished the 6" walls and I can cross off all the 3" walls, too. Not that many pages to go now - awnings, supports, roof ends... A couple more days should do it. I'm thinking of either using the Thoumont's wooden floor as the flat roof, or else I might try to take the tumbleweeds off of the Tunbleweed Pass roof tiles. Has anyone used the "toppers" from the set? Can you explain them to me a little differently than the instructions? I don't quite get what they're used for, so I haven't figured out what kind of textures I might apply to them. From the instructions, it looks like one way they are used is to add a glue flap to the bottom of flat walls that don't have flaps ('cause you turned the 2-story wall into 2 1-story walls) when you're looking to make a permanent building. The other use is if you're putting a flat roof on the building- the "topper" gives the wall extra height/strength? This'll be one of those things where I'll have to build one of the originals before I hack at it. Also - how do these things stack? I'm making all my pieces fold flat. It seems like they'll be sitting pretty precariously on each other... Is this also what the 'toppers' help with? The other use is if you're putting a flat roof on the building- the "topper" gives the wall extra height/strength? That's precisely what they're for. Once you've built one it'll make perfect sense. I'm going to go out on a limb here, looking at this. I don't think this should be offered up as a Kitbash, but rather it should be offerred up as a full product. Without a whole lot more of effort, the 'missing' props from VillageWorks could be added and we would, at last, have a replacement for that set. Kudos. Very well done so far. That was the intention, provided people were cool with the SS format. Unfortunately we're all too busy at the moment... and mproteau is too damned fast! Anything in particular you need kitbashed? I'll be submitting the Thoumont's stuff as a kitbash so you all can see it. It's up to you whether you want to accept it, reject it, repackage it... I'll be too busy making a village to get worked up if you decide to reject it. The time-consuming bits are usually where I don't have enough original texture to fill in the new geometries, so I have to fill it in myself. My primary focus is doing the original textures justice, but sometimes I lose track of the forest, looking so closely at each pixelated tree. I "kitbashed" the title of the mounts too. Figured I'd get that out of the way. Remaining are the 3" and 6" roof ends, supports and toppers, the awnings, balcony, corner caps and hall pieces. Now that I think about it... I don't recall seeing any horizontal slots for things like the awnings. Bah! I missed them when making those pages! Well, add that back to the list then! I would have noticed when I got around to robo-cutting them all out. Feels like I should be done by the end of the month, though! So tonight I fixed up the 6" walls that needed their little cutouts, and I printed out two full sets of 6" walls, and the 2nd of the sets of 3" walls. My robocutter and I have been busy retelling the papercraft story of John Henry. I am no match for the machine, however. I've been doing the scoring, then using the cutter to only, well, cut. My blade is super-dull at this point, so I'm double-cutting each sheet. Waiting for the perforating to finish was killing me. For whatever reason, the 3" pages all cut perfectly, but the 6" pages just don't seem lined up (or scaled right, for that matter) with the cuts. It slowed me down a bit, but I had to tweak the 6" cutfiles for each page. I'd really like feedback to find out if I've done something wrong with some of my pages, or if in fact the cutfiles are off a bit. I'm happy to submit all my files with "fixed" cutfiles - I just hadn't figured on spending time doing that. I have 8 more pages to go, but I'm too tired to cut any more pieces... I'll start making mistakes like feeding pages in upside down... I've got a little over an inch high stack of wall pieces to edge now. Tomorrow I'll print and cut a couple sets of the roof pieces, and if I still have any cardstock left, I'll print some flat roof pieces. You're not talking to yourself, I've been looking over your shoulder and watching you work. I had no problem with the 6" walls and roofs going through my robocutter, were all of the 6" ones off for you? My 6" pages of those cutfiles worked fine. I have cut the entire set (not your kitbash changes obviously) and didn't notice any issues. are you sure you printed your 6" pages out with no scaling? Well, I've got enough sense to never say "yeah, I'm 'positive'" without actually double-checking, but I'm *really, really* pretty confident I'm not up against a scaling issue with the printouts. I printed out three other PDFs in the same session and they were spot on. I know that when I bring my jpg into the studio software, it's reg marks lined up perfectly with the cutfile, and the cutter had no trouble reading the reg marks on any of the pages (whereas if there was some scaling of the printout, it usually won't find the reg marks). It was only off by about 1 or 2 millimeters, lining up perfectly on the end of the printout with the set banner, and being off by 1 or 2 mm on the other end. Not enough to totally ruin the piece, but enough that I'd have to color in some thin white strips around a couple edges. I'll try a couple things - First, I'll try cutting one page from the original set. Well, three pages really. There's no point in me cutting two walls out when instead I could cut out a whole building. This will tell me whether my experience is consistent with the original set or not. I'll also double check that I haven't done something dumb, like accidentally adjusted one of the layers in GIMP by some miniscule amount. Second, I'll package up one of the pages I had trouble with along with the exact cutfile I used, and I'll see if one of the kitbash reviewers can have a chance to try it out. You reviewers want a preview of what I've put together? I wanted to believe my cutter was just getting tired from cutting out 40 pages of stuff. But the fact that the cuts matched exactly what the software displayed makes me think the cutter was in rare form last night, and dutifully cut the pages the way it was instructed. 1) A tiny mis-adjustment of GSM imported registration marks. I only see this when importing .GSM files for models with pre-positioned registration marks. These days, I always print from Studio and remove the pre-placed regmarks by covering them - letting studio print it's own regmarks. 2) The printer stretching the printout over the length of the page. I switched printers when I discovered my HP was losing .1" every 10". This required a fine-gradation ruler, which I had to print on a different printer! Though, the cutter auto-compensates for some of this stretching, but not enough. 3) The cutter needed calibration. Lastly, I check the cutfile itself zoomed in about 7-8 times. Sometimes the model is just loose. I printed a page off from the original set and my set onto thin paper. I held them up to a white screen on my monitor. They line up just fine. I really think it's the cutfile that is off, not my machine, and not my PDFs. I printed and cut one of the tumbleweed pages you mentioned. File comment: Top portion of the page you mentioned. File comment: Bottom portion of the page you mentioned. Well, here's another question - do you use a carrier sheet? I do. I've noticed that when you toggle a carrier sheet on or off in the Studio app, it does things to the reg marks. Not sure if it does anything to the cut lines too. Ugh this is frustrating me like crazy now, mostly because I'm having one of *those days* at work where nothing is going right. I tried this morning making a new cut file for a slightly different type of broken wall, and I had the exact same issue with the cut lines not lining up. Are you running the latest Studio version? I just don't know what I'm doing wrong!!! I use a sheet of cardstock with adhesive spray as my carrier sheet. My software version is 2.5.8 (which is possibly not the newest). Thanks. I PM'ed you a link - if it's not too much trouble, can you try a similar page from my PDF? If it 'just works' then I won't let this get in the way of me packaging up the project. If it doesn't work, then I'll pull the brakes on production while I sort out my issue. I've noticed that when you toggle a carrier sheet on or off in the Studio app, it does things to the reg marks. Not sure if it does anything to the cut lines too. What version are you running? Make sure you have 2.7.3. The previous version did some stupid stuff with forgetting the carrier sheet (and other) settings - which several of us promptly reported and most of which are fixed with 2.7.3. When the carrier sheet option is turned off, it CHANGES the top margin and turning the carrier sheet option back on DOES NOT FIX IT. Lame-o! It will definitely break your cuts. Like I said, the newest version seems to remember the preference of using a carrier sheet between new documents. Thanks oldschooldm. I installed 2.7.3, but still no change in behavior. But it's not just a vertical alignment issue. The left side is lined up, but the far right cuts too wide. I have tried several of my images. The 3" walls line up fine, and most of the 6" walls do too. I just don't get it, but I'm not going to bother worrying about it. Tonight's progress... I'm still cutting out pieces. I've now got two complete sets of 3" and 6" walls cut and edged (that's 26 pages of walls!) and one set of 3" roofs. I'm going to need more 3" roofs... 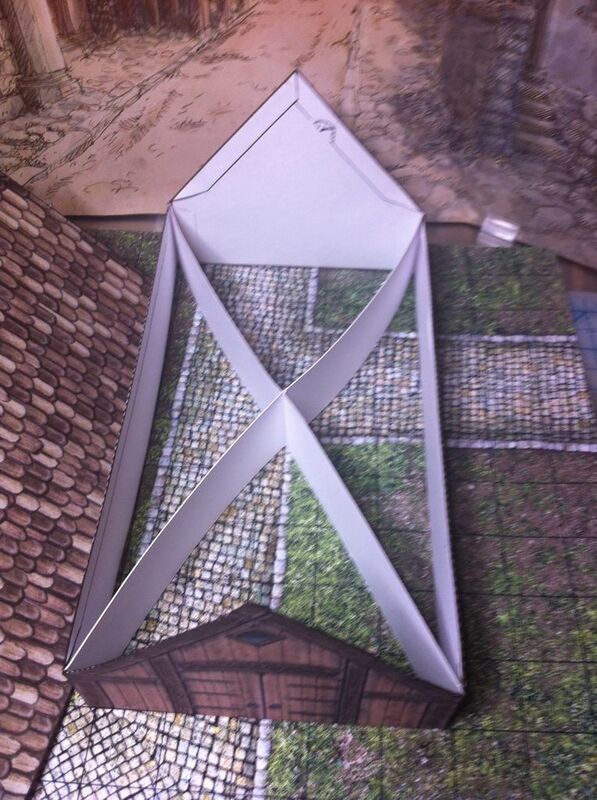 I printed 2 sets of the 6" roofs, and am six pages away from finishing the cutting and edging. I'm glad I'm going through this, as I discovered one roof piece where I left a section totally un-textured! I have no idea how I pulled that off - the image in GIMP has the texture. The exported image on disk has the texture. Oh well. It's just the underside of a roof piece. Rather than waste more ink, I'll just color it in with a brown crayon. Soon enough I'll be roping the kids into helping me come up with building shapes to assemble!